Welcome to Poco (ポコ) documentation! The following example shows a simple script on demo game using Unity3D. Check More examples section for more detailed info. 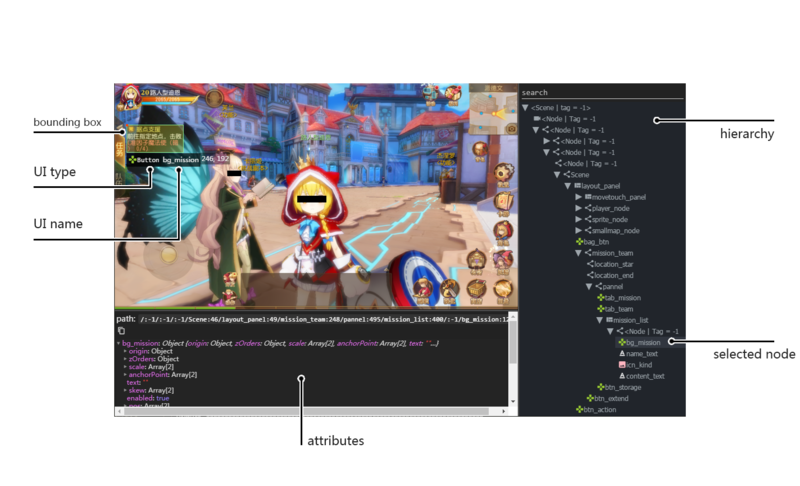 To retrieve the UI hierarchy of the game, please use our AirtestIDE (an IDE for writing test scripts) or standalone PocoHierarchyViewer (to viewer the hierarchy and attributes only but lightweight) ! This section guide you how to start to use poco to write your test cases on different platforms/engines. This section will let your know all basic features of poco. You can find all functions/methods for writing test scripts under the following links. Poco defines an uniform format to serialize UI hierarchy for different game engines. This section shows how to dump UI hierarchy. The following is the snippet of UI hierarchy. All UI elements are organized in dict representing the tree structure. More detailed info about properties are described in .dumpHierarchy().